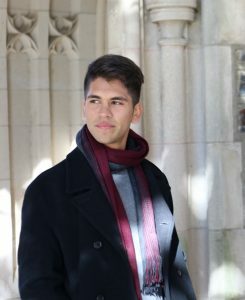 This interview was conducted over email with Jair Oballe, a senior undergraduate student enrolled in the Human Rights Certificate Program, majoring in Cultural Anthropology and Political Science, by Miranda Gershoni, a first-year undergraduate student working for the Duke Human Rights Center at the Franklin Humanities Institute. Miranda Gershoni (MG): Why did you decide to pursue the human rights certificate? Jair Oballe (JO): In the spring of my first year, I decided to take the Intro to Human Rights class with my first-year advisor, Prof. Robin Kirk. Her class introduced a framework of basic rights that existed outside our preconceived notions of citizenship and class. I wanted to see how else these concepts could be applied in other areas of my studies moving forward. MG: What makes this certificate unique from other programs at Duke? JO: It seems to be the most interdisciplinary certificate we have to offer. People don’t seem to realize human rights can be implemented within urban planning, engineering, or farming and agriculture. The courses that count towards the certificate are quite different from each other, but that makes it all the more exciting. MG: How has the multidisciplinary, experiential nature of the program affected your learning while in the certificate? JO: It has encouraged me to look for human rights alternatives to legal and political issues, whether it be weekly readings or my real-life interactions with marginalized communities. For example, some of my certificate coursework came from a study abroad program in Brazil, where I worked on a gender-based violence research project with an Afro-Brazilian women’s activist group. MG: How do you plan to use the information and experiences you’re gaining from the certificate? JO: My certificate and major are overlapping in a senior thesis on the criminalization of undocumented immigrants in border states through en masse deportation hearings, a tactic known as “Operation Streamline.” Without my previous courses in human rights, understanding the multifaceted dimensions of immigration policy and legal procedure would have been far more difficult. MG: What has been the most impactful moment (lecture, activity, reading, professor, etc) you’ve gained from the program? JO: My sophomore year, I took a course with visiting professor Marisól LeBron titled Policing Latinidad. It taught me a history that was never presented in my high school history books and was the spark in my academic path in understanding our nation’s border communities.